Three cheers for great Studio-mates! Check out these forthcoming shows! My studiomates rock! Ping Pong Gallery is pleased to welcome Amanda Curreri back to the gallery for her second solo exhibition, OCCUPY THE EMPTY. There will be an opening reception for the artist this FRIDAY, June 11, 6-9PM. Following the inspired careers of such artists as Felix Gonzalez Torres, Lygia Clark, and Helio Oiticica, whose work centered on the commingling of public and private spheres, and the sustained commitment to narrative, social engagement and cultural commentary, Curreri offers an exhibition that depends on the consideration, sensitivity, and participation of its audience. OCCUPY THE EMPTY is born from an experience the artist had last summer in the Massachusetts courthouse where Italian-American anarchists, Sacco and Vanzetti, were sentenced to death in the early 20th century. The court case Curreri participated in was for her deceased father, also an Italian-American. The experience of those two weeks spent in the historical courtroom with her father’s loved ones, with lawyers, a judge, and jury shared qualities with the dramatic arts and the stage: theatrical and performative, positioning Curreri as one of the characters. Inspired by the work of radical democracy theorists Ernesto Laclau and Chantal Mouffe, Curreri considers the assumption that democracy is inherently available, empty to be inhabited, performed and occupied. This exhibition takes the courtroom, the American hallmark of democracy, and translates it to the space of the gallery. Explicitly empty by design, the gallery becomes a tangible stage for testing ideas of personal histories, democracy and the social body. WithinOCCUPY THE EMPTYare paintings and sculptural arrangements, schematic works on paper, documentation, and an interpersonal durational piece that will come to create the portrait of the people involved in the themes of the exhibition. Working in response to ideas of community, family, history, equivalence, Curreri’s work suggests that individuals, perhaps fixed in certain roles, can become illuminated, freed, re-invented, and moved to a place where they can participate, act, and speak freely. By shifting the expected experience (spectatorship?) within the gallery, and making intimate/active the relationships within, the artist traverses the divide between public and private. In so doing, Curreri encourages the formation of a broader social movement, one where the audience of active creators becomes part of the story, sharing and ultimately helping engineer a collective transformation. The invitational gesture for viewers to play a part in the formal creation and conceptual democracy of the work is one that might come to highlight the healing qualities of art and its ability to serve as catharsis for viewers. In the words of Helio Oiticica: “The crucial point of these ideas […] is that the artist’s task is not to deal in modifications in the aesthetic field, as if this were a second nature, an object in itself, but to seek to erect, through participation, the foundations of a cultural totality, engendering deep transformations in man’s consciousness which, from being a passive spectator of events, would begin to act upon them using the means at hand: revolt, protest, constructive work, to achieve this transformation… (General Scheme of the New Objectivity). Curreri holds an MFA from the California College of the Arts, a BFA from The School of the Museum of Fine Arts, Boston, and a BA from Tufts University in Sociology and Peace & Justice Studies. The artist was the recipient of a Joan Mitchell Foundation fellowship in 2009 and her work has been reviewed in the San Francisco Chronicle, ArtForum.com, FlashArt Online, The SF Weekly, and The Portland Phoenix, among others. She is the co-editor and co-founder of an (ir)regular artist publication, Color&Color, which aims to tactically connect artists with new audiences and expanded dialogue through the serial print medium of small books. 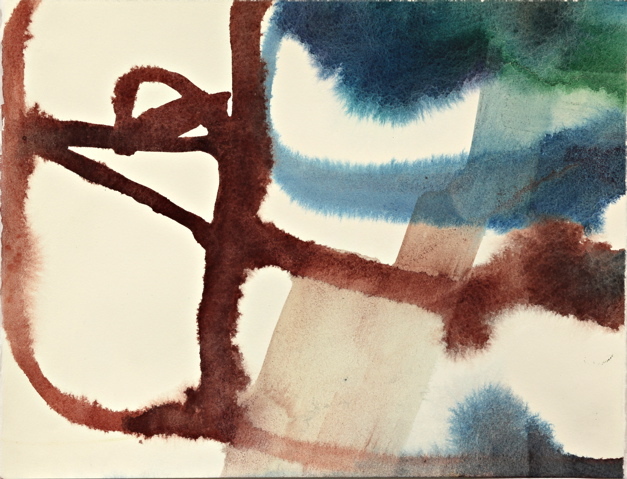 Like a poem buried in the silence of things…Linda Geary’s abstract watercolors are full of unexpected configurations. Spontaneous drips and blurred bands of elegant color recall ambiguous plant and landscape forms but mostly refer back to themselves. There is a tension between her reductive, expressive line and blocks of organic melting color. We are somehow at a remove from the emotional qualities of color. Two-dimensional space is indicated without symbolism. At first look they appear to be describing the process of their own making but gradually her particular place emerges. No matter what the scale they feel monumental. Color extends past the page’s edge with a vastness that recalls Chinese landscape painting. She transposes compositions with ease to a very large size for the medium (up to 40 x 60”). Some sing in elegiac tones interwoven with underwater darkness. Others are about pure and brilliant light. The simple titles reveal her preoccupations: Fuse page, Split side, Saw tooth, Untraceable, Fall out, Zero to indigo. Aqueous light as well as a physical sense of water mixed with pigment reinforces the materiality. She allows the paint to do what it will, to pool and run and blend without losing control. Geary’s expansive openness grants us the latitude to acknowledge the ambiguity inherent in vision itself and it’s promise of free play of the mind. Recent exhibitions and publications include, 2010 Solo exhibition, Rena Bransten Gallery, SF, 2010 Interview with Bruno Fazzolari and John Zurier, in Artpractical.com. 2009 Group Exhibitions at Pulliam Gallery, Portland, Rose Burlingham, NY, 2009 Night Tide, curated by Colter Jacobsen, SF, Pulliam Deffenbaugh Gallery in Portland, Oregon; Barry Sakata Garo Gallery in Sacramento; and HP Garcia Gallery in New York. Her solo exhibition at Rena Bransten Gallery, San Francisco, was reviewed in ArtForum (February 2007), residency at Art Omi International New York in 2007. 2006, solo exhibition of works on paper in Otranto, Italy, organized through the Bau Institute in New York and Otranto, curated by Lilly Wei, with a catalog essay by Kenneth Baker. Bay Area art: workin’ it. Really, really excited that even if I have to leave one awesome art community (in Manchester) I’m coming straight home to another (in the San Francisco Bay Area). So good to be home, so thankful for really bright CCA folks doin’ it. The shows at SF Camerawork are really good — all having to do with manipulation and desire. It got me thinking a lot about the manufacture of images, advertising, graphic design, and the crafting of paintings… The photographs are really well crafted. I’m not always easily impressed by photography — my appreciation for technical feats is pretty limited — but I was really impressed with the quality of the works and curation. Thoughtful, good stuff. Live and Direct opens at Ping Pong Gallery Friday night. Curated by cohort Amanda Curreri, and including a number of really thoughtful CCA MFA artists like Nyeema Morgan and Erik Scollon.